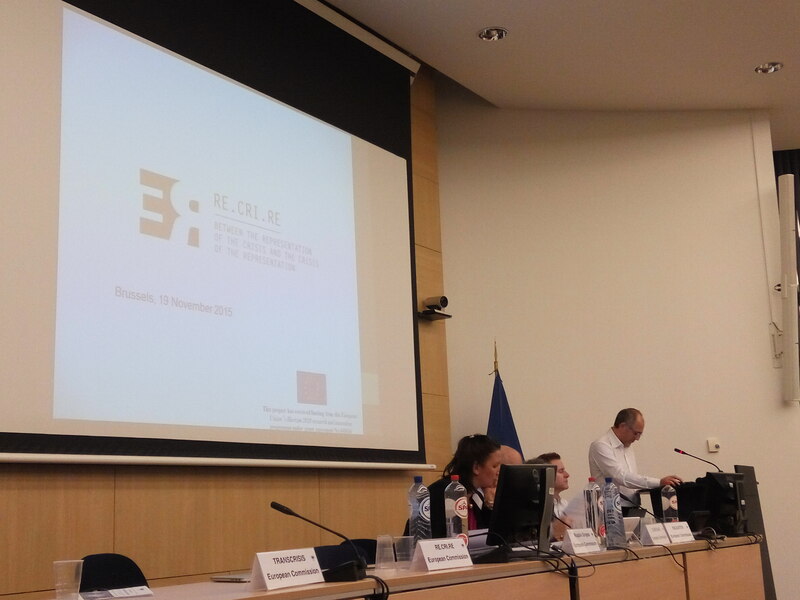 The RE.CRI.RE project has been showcased today to the European Commission and its executive agency REA by a small team representative of the whole consortium. Ms Antonella Valmorbida, Secretary General of ALDA, Prof Sergio Salvatore, University of Salento, Prof Alessandro Distante, President of ISBEM, Aldo Xhani, Coordinator of the Citizenship programme at ALDA and Ms Viviana Fini, researcher at ISBEM composed the team. RE.CRI.RE brought its methodological analysis into the panel addressing the topic â€œPolitical challenges in Europeâ€ aimed at understanding what the research in social sciences and humanities tell us about changing Europe. The project will represent a milestone within ALDAâ€™s citizenship programme in the upcoming three years. ALDA, in cooperation with its strategic partner ISBEM, is the coordinator of a network of 14 universities coming from 12 different countries across Europe. Promoting good governance and citizen participation calls for a deeper reflection on the symbolic universes grounding social identity in order to analyse whether a major change occurred in European societies as a consequence of the socio-economic crisis. Reflecting upon the categories citizens adopt in representing the outside world is key to develop effective policies at all levels of governance. The Trust Conference is organized by Net4Society. Net4Society is the international network of National Contact Points for the Societal Challenge 6 “Europe in a changing world: inclusive, innovative and reflective societies” in Horizon 2020. National Contact Points (NCPs) are set up to guide researchers in their quest for securing EU funding. The kick off meeting is followed by the public conference â€œRe.Cri.Re. 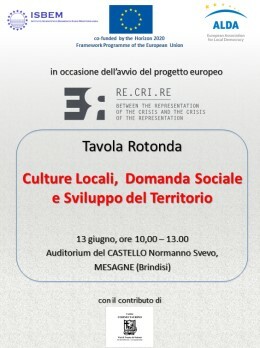 and demand for social developmentâ€ (Mesagne, Italy, June 13th 2015), with the participation of regional public authorities, discussing perspectives and opportunities of Horizon 2020 and presenting the main topics of Re.Cri.Re. project. The kick off meeting of Re.Cri.Re. 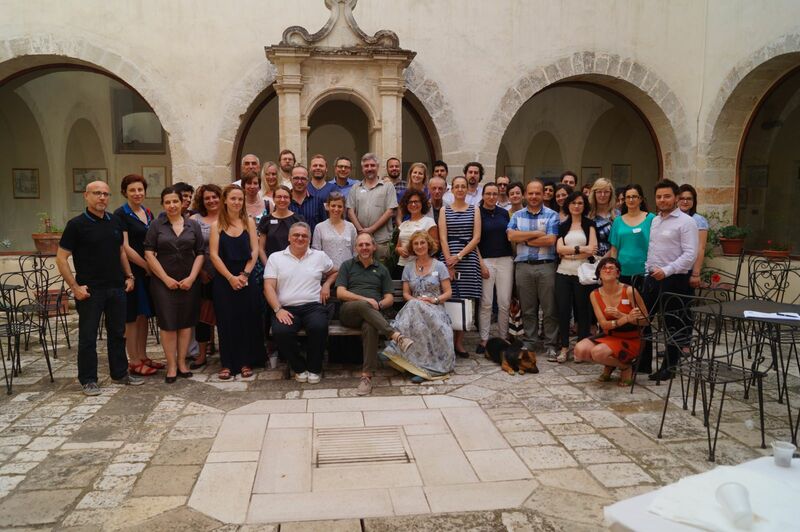 project was hosted by ISBEM in Mesagne, Italy in June 11th-13th, 2015. Partners shared their view on project goals in the first day, and then they discussed the overall structure of the project, the WPs and the workplan during the second day. Partners also set up the Scientific Committee.